As I wait in for my “ride home” at SFO, I am trying to process all that is Google IO. Have recently emerged from many years in Microsoft ecosystem, and I am am feeling like I in the right place at the right time. Top Line – Google hits all competition – hard. Even through the lens (the bubble?) of the converted (and Google IO is full of them), it’s a stark reality that all of former Softies have to face, the world is changing and we have to as well if we want to stay relavent (and employed). What does this mean exactly? 1) Tablets and phones – it’s a war and Google pulled ahead with the release of Jelly Bean for Android here at IO. Of course they gave every attendee a Nexus tablet and phone on the first day, so that we would use them at the conference. Contrast this to the old-school PR show that MSFT ran last week to preview Surface. No one was allowed to touch their device. Amazon will fire back with a new Kindle Fire shortly and there are rumours that Apple will release a 7″ iPad as well. Shown below is the ‘swag haul’. 2) Android is developer-friendly – more than 50% of this conference content was aimed toward Android developers. 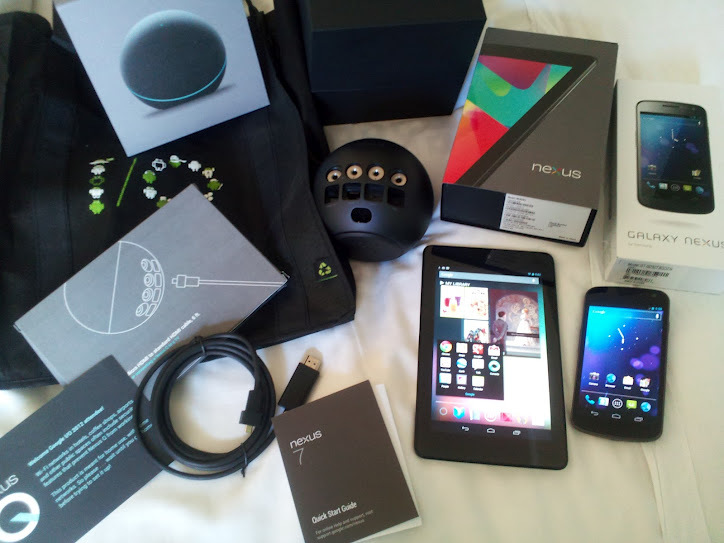 There were additional giveaways for those attendees who were lucky enough to actually get into the Android sessions. 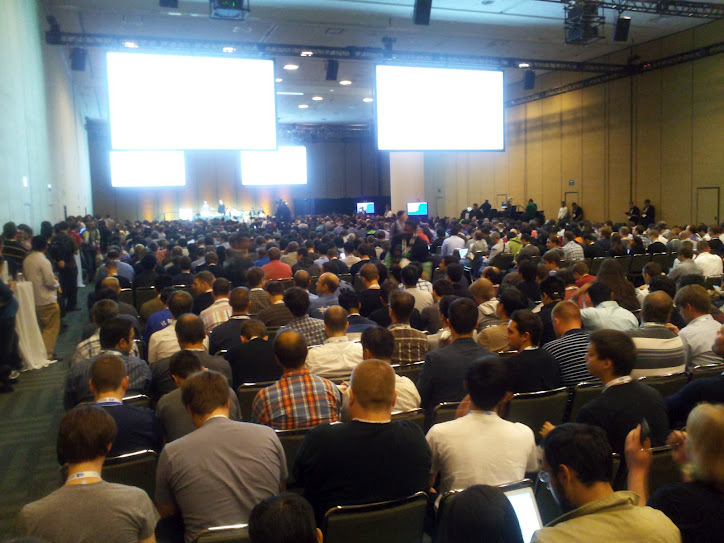 Not being an Android developer myself (yet), I just watched the huge lines for all of the Android sessions with surprise. I sat in one session for about 15 minutes, but the screens filled with code bored me silly. 3) Look out Amazon – Google has some serious offerings in the cloud. The big announcement here was the beta of Google Compute Engine (or IaaS). Also Big Query quietly came out of beta shortly before IO. It’s essentially a massively distributed query process (Hadoop-like) that allows you to use SQL queries, rather than MapReduce. Cheap, simple and powerful – are you paying attention yet? Preview and incredible demo of Google Glasses – You’ve probably seen it (YouTube above), but I was THERE. And then, they did it again (and explained how it was done), just because, they can. Damn! In case, you are wondering, yes, of course I signed up to give Google my $ 1500 for the first technical preview of Google glasses. The people – really I just spent most of my hallway time listening. I am utterly convinced based on what I heard that the smartest, most talented developers on earth were all in one place for 3 days. It was really astounding. Between what I heard and the NDAs I have with all major companies, I really can’t share anything more specifically here yet unfortunately. Quiet announcements – amidst all the Android and Cloud fanfare a couple of smaller releases caught my eye – Google Drive SDK 2.0 has some interesting application integration features. Google Now on the phone, in my initial test, when combined with the improved voice search, work great. The venue, although cool, was too small. There were many long, long lines and huge crowds. Given the attendance (I think around 5,000), there are venues that can hold a crowd this size more comfortably. The crowd, as time, posed an actual safety risk. Getting a ticket was too difficult. I was actually invited, but I heard many horror stories of people opening multiple browsers routed through multiple continents and automating requests to try to get a ticket before the conference sold out (about 20 minutes after it opened). I mean, really, with all the bragging about ‘Google scale’ infrastructure, I can’t help but wonder, was this by design? What, no Java? If you want to work with all of the rich Google APIs, then you better be prepared to code in Python. All of the session code demos that I attended were delivered only in Python, and, if asked, the presenters seemed pretty clueless about Java capabilities. 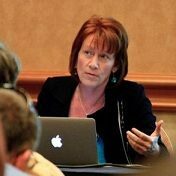 I am trying to figure out if I should just give up and start coding in Python, or if I should continue to give feedback to the Google Developer Advocate groups that Java is the preferred (at least over Python) language of the enterprise, and that they’ll get broader adoption there if they make a bigger effort to improve both their APIs and documentation in Java. Great conference, great products, great crowd – well worth it.